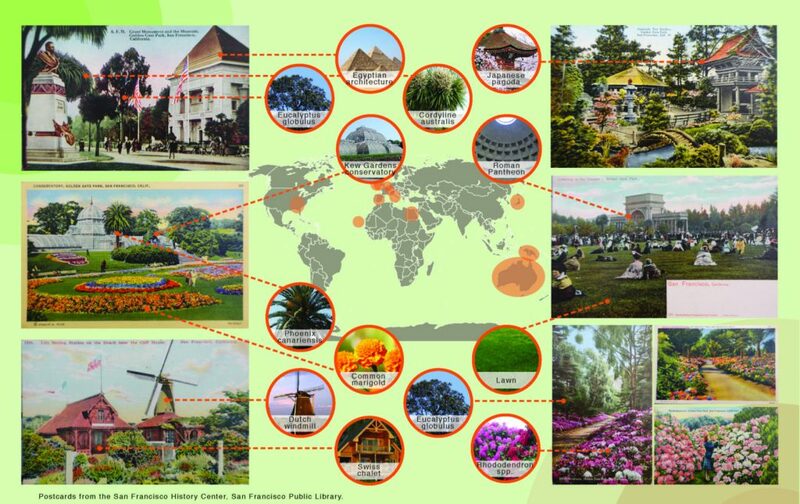 Historic postcards, brochures, and contemporary websites feature plants, animals, and structures from all over the world: Golden Gate Park offers, "the best of all worlds." California, a state historically pitched as a land of sunshine and plenty, has very little water. And as temperatures rise and the climate changes, water will become more scare every decade. Nonetheless, entrenched practices of water use persist, especially in service of the long-standing cultural idea that landscapes should be green. San Francisco’s Golden Gate Park exemplifies the state’s problematic relationship with greened landscaped. Built on top of sand dunes in the 1870’s, designer William Hammond Hall closely followed the plan of New York’s Central Park, creating a thousand-acre landscape of meadows and forests. But in the West, summer irrigation is all that keeps lawns from blowing away. Today, the parks department adds the equivalent of about fifteen inches of rain per year through irrigation – essentially replication Seattle’s annual rainfall. That water, historically drawn from the unrenewable aquifer below the city, will soon be supplied by a massive reverse-osmosis recycled water treatment plant. An ethical dilemma emerges: even if irrigation water can be found, or created, should it be used to perpetuate an unsustainable nineteenth-century landscape aesthetic? As the premier urban park in Northern California, Golden Gate Park sets up expectations than an English garden aesthetic can and should exist in California’s arid climate. And by rendering the costs of this aesthetic invisible, it perpetuates the root cause of the state’s drought: the belief that California’s landscapes can be “reclaimed” and turned green. Flipping that assumption, and arguing that this great public space can change incrementally and thereby teach new ideals of beauty, un-greening Golden Gate Park would dramatically and beneficially impact California’s relationship with water. Historic postcards, brochures, and contemporary websites feature plants, animals, and structures from all over the world: Golden Gate Park offers, ͞the best of all worlds." After New York City’s Central Park was built in the 1850s, a flurry of park building in other large cities followed, all in similar styles. Boston’s Frederick Law Olmsted designed many of them. None of Golden Gate Park’s major early benefactors or designers grew up in California - they were all from climates with humid, wet summers. Their landscape preferences had been shaped by their early surroundings, and they reflected these preferences in the park they built. 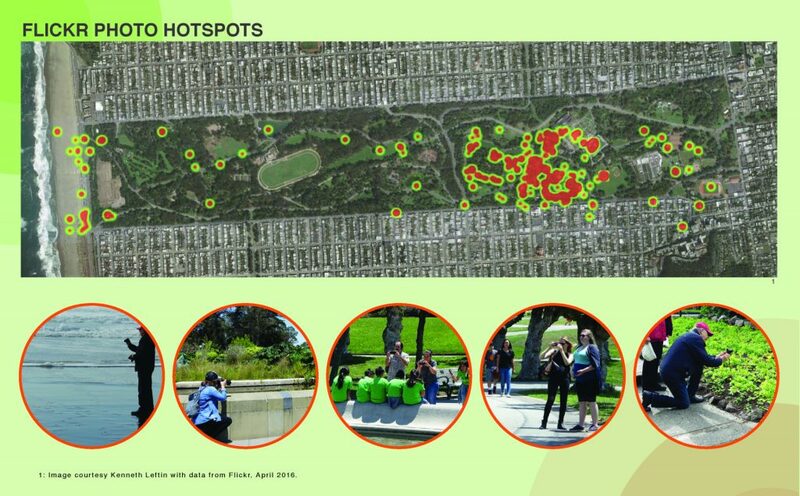 We could start un-greening in the park’s most popular places - the places where people take the most photos.